Welcome to the future site of the Brass Bobbin. This site is currently under construction. Photos and product information are coming soon, and will be available on Steampunked Out. What is the Brass Bobbin? Why can’t clothing be both elegant and rugged? We want to outfit your adventurous experience with the best quality and style possible, whether it is located in the great outdoors, in the big city or indoors. While Steampunk sensibility informs many of our style choices, we know that these pieces are also timeless. We are committed to local and eco-sourcing whenever possible, and seeking out the best ways to maintain low-impact production while bringing you the highest quality materials and products. Since this is an "origin business", we are personally involved and developing all aspects of a product’s life-cycle. What is an "Origin Business"? An origin business is a business which is both devised and realized by the owners in a three-fold process: designing, manufacturing and retailing their own products. Design: Nearly everything we sell is designed, prototyped, and tested by us. This involves historical and material research, patterning and fabrication, product testing by ourselves and others. Manufacture: Attention to detail is a must. We hand craft our goods with professional precision in our workshops, not in a distant factory. Retailing: We are committed to providing goods as directly as possible to the consumer. By not having multiple distributors, we are able to keep prices as low as possible. Our goods can be purchased directly from us online or at trade shows and conventions. We may also work with local retailers, allowing customers to physically see our products before buying them without having to wait for the next convention. This is more than a hobby or cottage industry. We have specifically dedicated workshops, and we are master-level artisans; professionals in our fields. Although I’ve been working with Steampunked Out as a consultant since its outset, Brass Bobbin snowballed into existence because my partner wanted a new version of his really worn out ivy cap. After years of looking in stores, I looked to see if there was a pattern available so I could make one. There wasn’t one in print or online that was the correct style, obtainable, or easy to use. That got me thinking about what other items weren’t available... and I discovered a void, particularly in period accessories, men’s wear, and active/outer wear (and I mean the Victorian kind). You will find that is where our current focus is at Brass Bobbin. 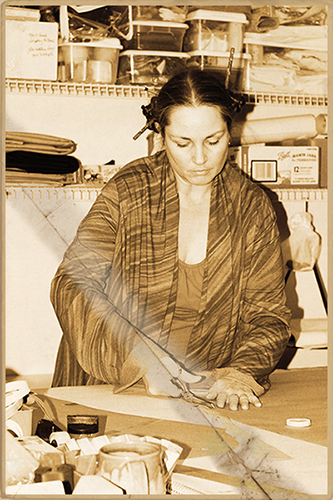 With an MFA in design, my 25+ years of experience in making and designing clothing and costumes is varied and extensive, including: theatrical and dance, period reconstruction, reenactment, ethnic, retro/vintage and contemporary clothing. It has taught me about all facets of research, design and creation of costumes and clothing, all of which goes back into the kinds of things we make.